Thank you for sharing so many of your amazing, illustrated found-object poems. I'm feeling especially drawn on this nostalgic weekend to the words and image of "Mama Planted a Garden." 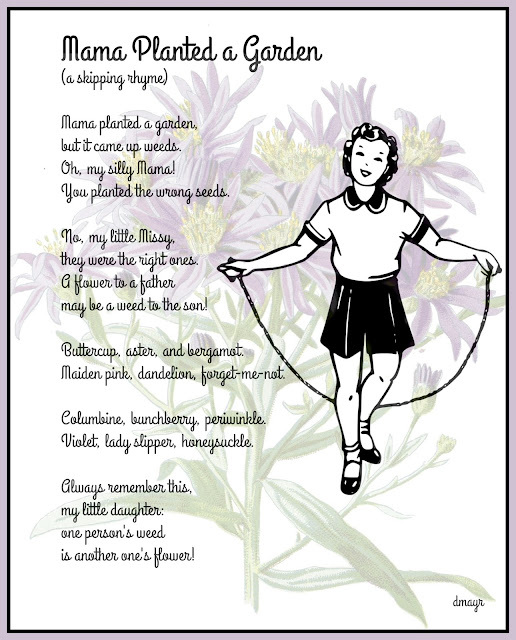 The last line's motherly advice (One person's weed is another one's flower! ), which I especially love, reminds me of an analogous expression spoken all the time by my father ("One man's meat is another man's poison.") God bless you, and thank you! Or, "one man's trash is another man's treasure." Point of view is everything. I love the juxtaposition of the image and poetry - I only ever manage to do that using an app - and taking photos of book pages - but this post elevates that to different level of art altogether. Loved seeing Linda's photo as well - very eerie, I thought. I loved the tomato poem most of all - very succulent. Writing about tomatoes in the cold of winter made me miss them all the more! You need to look into PicMonkey.com/, Myra! Then practice, practice, practice! After a while, it becomes so easy it almost feels like cheating. You've been busy, Diane! Lovely poems - thanks for sharing them. I might try a few found-object poems myself. As my late mother used to say, "Idle hands are the Devil's workshop." Please take part, we're not even half-way through the month! I am mesmerized by your poetry. What a gift you have. I love the walnut face one, such an important message. Thank you, what kind thing to say! I look at the tomato in the photo, and then I look at the tomatoes I bought at the grocery store, and I think, Damn! It's zero degrees outside! I always am admiring of your poems, Diane, and that you take me to new places with the POV. 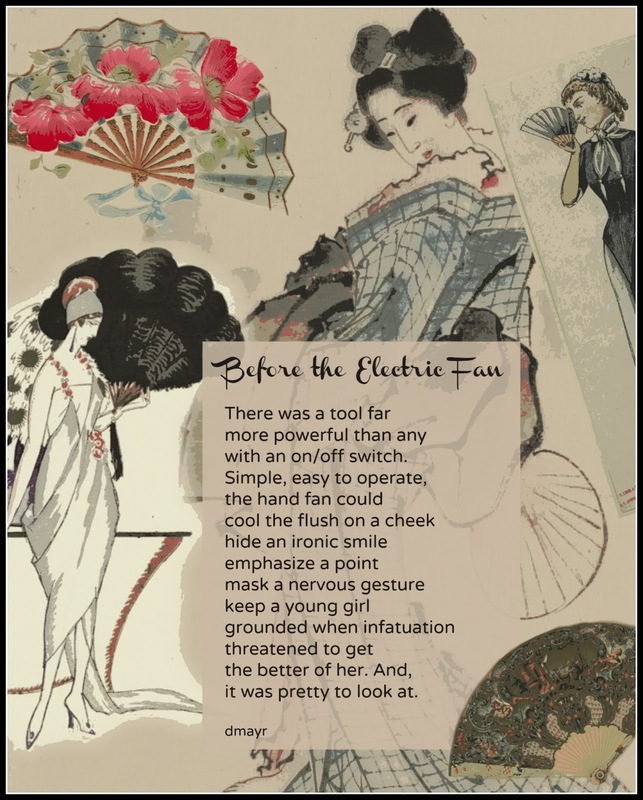 Love these, but my favorite is still "Before The Electric Fan". I've read Lisa See's Snowflower & The Secret Fan with students several times, and enjoyed that story very much. I forgot about that book! And the secret writing on the fans. And the foot binding. An eye-opening book. What a wonderful group of poems and pictures, Diane! Re. the fans: I've had the pleasure of getting to know a writer and historical presenter here in Beaufort, Kim Poovey, who dons authentic and/or hand-sewn Victorian duds and educates audiences about Victorian and Edwardian conventions. I've heard her explain the intricately detailed communications via fans more than once - oh, my! Amazing what young ladies and young gentlemen spoke without saying a word, just by the myriad placements of those frilly little fans and the way they were held. I'd love to see one of Kim's presentations! I am so enjoying all the the poems and the new community around this project. Until this year, I've not fully committed to a poem a day in February with Laura. Glad I did this year! I like having a challenge that holds my toes to the fire and keeps me writing! Toes to the fire--absolutely right! All lovely poems! And now I'm longing for summer tomatoes and wildflowers! I love the delicacy of wildflowers--they don't flash you like cultivated flowers do. And, I especially like when they show up in unexpected places. Bring on spring! What a crop of images your poetry creates. Each one makes me smile in a different way. 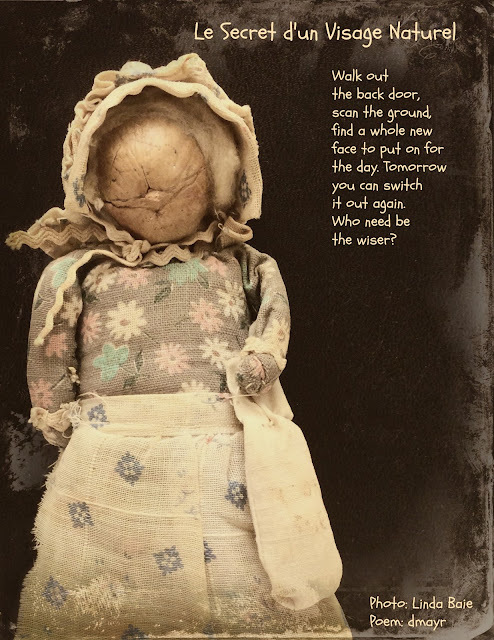 You bring Laura's found object project to another level with this work! Thank you, Julianne, I like to bring a smile once in a while. What beautiful handiwork, Diane! 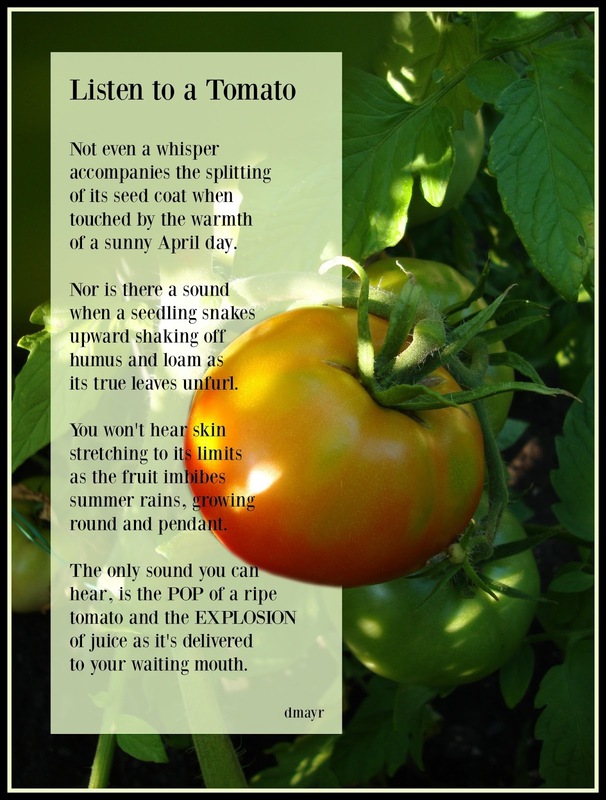 I love how the tomato rests on the climatic stanza: "skin stretching... growing round and pendant," right before it bursts. What Tabatha does in matching poem to music, you do matching poem to image. Diane, I so enjoy seeing these. I read some of them unillustrated on Laura's site, but the digital illustrations add a lot. Your skipping rhyme is so fun! I love how each day's photo brings out different perspectives. Love reading these poems with the photos that inspired them. I especially enjoyed the tomato one--so nice to imagine warm ripe tomatoes on this frigid winter day!